The Prairie Grasslands Region is one of the most endangered habitats in Canada, but grasslands aren't found only in the Prairie provinces. There are patches of them in Ontario. Some grassland flowers grow so high that you'd have to climb a ladder to come face to face with their blooms. Many species of wildlife depend on the Prairie Grasslands Region for their survival. For instance, the Powesheik skipper butterfly, long-tailed weasel, and grey tiger salamander could disappear from Canada without the tall-grass prairies of Manitoba. • Tall grass, which occurs in southwestern Ontario and south-central Manitoba, includes big bluestem, little bluestem, Indian grass, switchgrass, leadplant, side-oats grama, porcupine grass, common sunflower, and several species of goldenrod. 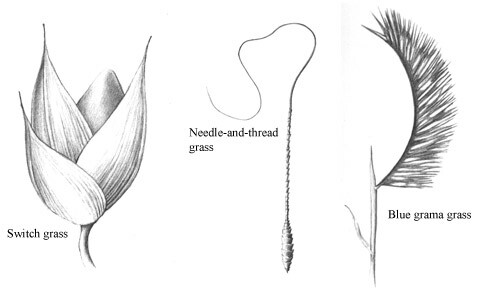 • Mixed grass, which is found in southern Saskatchewan, southwestern Manitoba, and southeastern Alberta, includes needle-and-thread grass, June-grass, golden aster, prairie-crocus, wheatgrasses, and breadroot. • Short grass, which occurs in southern Alberta and southwestern Saskatchewan, includes blue grama, sedges, western wheatgrass, rabbit-bush, and little club-moss. • Fescue, which occurs in the foothills of Alberta and in east-central Saskatchewan, includes rough fescue, slender wheatgrass, three-flowered avens, golden bean, northern bedstraw, and yarrow. • To start, you'll need a large backyard or community lot. It is critical to control weeds during the first two years, so plant an area you can comfortably keep weed-free - half a hectare or less. • Ask your local agriculture department for advice on soil type and the best species to grow in your area. • Get your seeds from a local source to ensure that they're native to your area. • If possible, till the top 2 cm to 3 cm of soil on your site several times during the fall and spring before planting to help control weeds. •The best time to plant is between late spring and early summer. • Plant a half-and-half mixture of wildflowers and grasses. • Remember that prairie species thrive best in full sun. • Familiarize yourself with what prairie seedlings look like so you don't accidentally pull them out while weeding. • Don't get discouraged! Prairie plants are perennials and don't show a lot of growth during the first year. They are busy putting down extensive root systems to help carry them through adverse conditions, such as cold and drought.